We just love the look of outdoor party lights on my deck on a summer night. Why not hang paper lanterns in pretty colors around your deck or in your garden at your next event? Make these cute paper lanterns from ordinary cardstock, vellum and plastic beads and your space will be looking festive in no time. This lantern craft is circle shaped and has pony beads as an added decorative element. You can construct several of these lanterns very quickly. Pick out the colors and patterns from your favorite cardstock sheets, cut the lantern parts on your die cut machine and assemble. Download files for cutting paper lantern parts. Cut one bottom piece and three circles from a cardstock sheet. Punch the inner circles with a hole puncher. Repeat above step for each bamboo skewer. Take the base of the paper lantern—the circular piece that has no center hole—and insert the skewers as in the photo above. This will be the bottom support of your paper lantern. Slide six pony beads onto each bamboo skewer. Place a paper ring onto the skewers as in the photo above. Slide six more pony beads onto each bamboo skewer, and top with another paper ring. Repeat this step. Your lantern should now have three paper rings and a paper base, each separated by six beads. Slide one final pony bead onto each bamboo skewer and attach with glue to finish off the lantern. Trim bamboo skewers using needle nose pliers or craft knife. Smooth edges with a little bit of sandpaper if desired. Take an 8.5" x 11" piece of vellum paper and, using a paper cutter or a ruler and craft knife, cut to create two pieces of vellum measuring 5.25 x 10.5". Roll one of the vellum rectangles into a cylinder shape lengthwise and insert into the center of the paper lantern. The vellum should cover half of the circumference of the center of the paper lantern. Roll the other vellum rectangle into a cylinder shape lengthwise and place it into the center of the paper lantern facing the opposite of the first lantern insert. 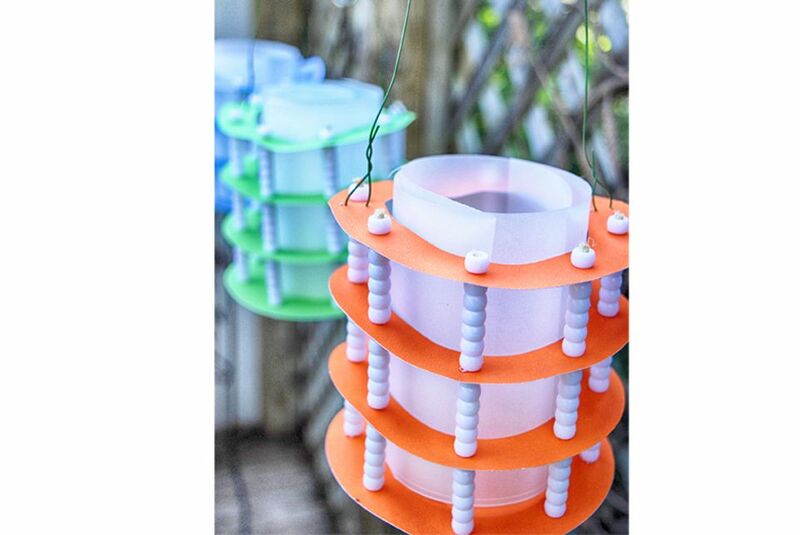 If you are planning to hang the lanterns punch two small holes on opposite sides of the top ring and run a piece of thin wire to form a handle. Place a battery operated tea light into the center of the lantern and hang or display.